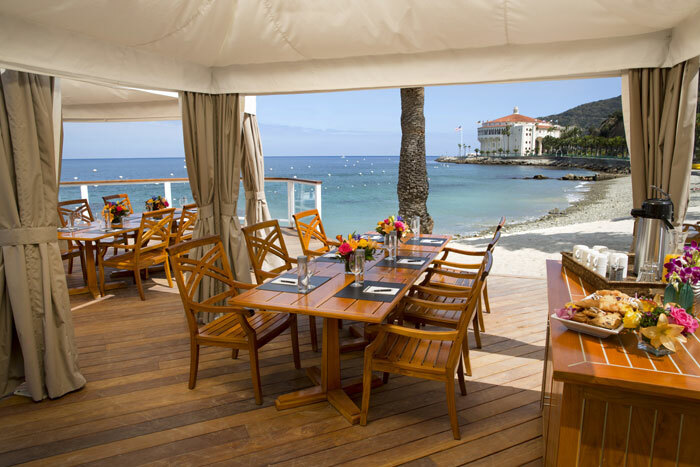 AVALON — Sunbathing on the beach has become a lot more luxurious, with Descanso Beach Club’s newest offering of presidential and standard cabanas, and chaise lounges rentals. The rentals are all part of the club’s ongoing $6 million renovation, the Santa Catalina Island Co. (SCICo) announced. Guests can enjoy as much — or as little — time in the sun as they want, with the choice of renting a presidential cabana that accommodates up to six guests. It features teak tables and chairs, chaise lounges, beach chairs, Oshibori towels, bathrobes, a refrigerator, a television and use of an iPad with complimentary Wi-Fi. A personal concierge is available on site to fulfill guests’ needs for drinks or other amenities. The three new presidential cabanas are available for daily rentals, along with standard cabanas and additional chaise lounges. SCICo has also expanded the amenities available at Descanso Beach to accommodate beachgoers needs. Descanso Fresh, a gourmet espresso bar and ice cream shop, as well as new retail stores are scheduled for completion in 2014. The new offerings are part of an ongoing $25 million investment SCICo is making in its properties and expeditions, in order to elevate the visitor experience to Catalina Island, Herrel said. The privately owned Descanso Beach Club is popular with visitors to the island, since it offers live music, fire rings, beachside massages and an on-site bar. Presidential and standard cabanas can be reserved throughout the year. Chaise lounges (booked as pairs) include a table and a sun umbrella. Reservations can be booked at (310) 510-7410 or at visitcatalinaisland.com.